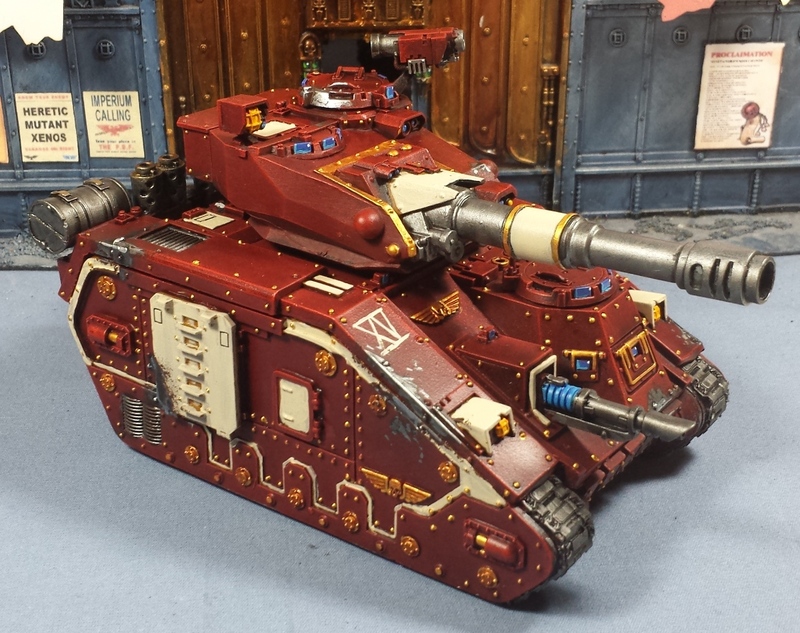 Mordian 7th Regiment: Heresy Era Thousand Sons - King Russ Vanquishers complete! Heresy Era Thousand Sons - King Russ Vanquishers complete! Snuck in a little brush time over the weekend and got some unit markings and the weathering onto the trio of King Russ Vanquishers for the Spireguard! I realized once I laid 'em all out that I don't really have a photo area large enough for them all at once! Sneaky servitor in the back checking out the unsanctioned variant for possible techno-heresy, perhaps? 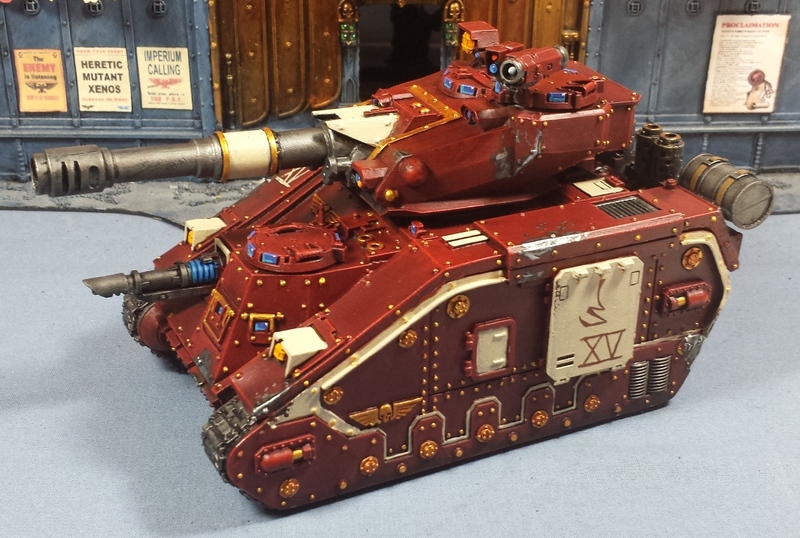 The addition of the bone-colored side doors really helped break up the expanse of red on the tanks, and provided a nice place to add in the regimental numbers and unit identifier. I stuck with the quasi-runic lettering, as it helps tie them out to the rest of the army - Once again, they don't really mean anything specific, I just went with some pleasing looking shapes. The weathering still is a bit of a challenge for me - Constantly trying to refine the technique, understanding the appropriate colors to use and amount to apply. 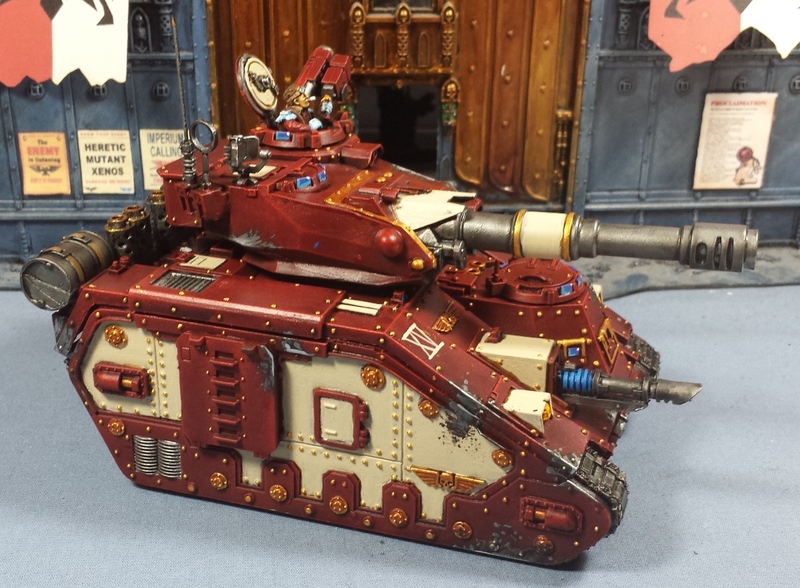 For the Thousand Sons vehicles I'm going with a scorched brown sponged on in various areas, followed by a further sponging of boltgun metal. These areas were given a little black wash and finally the extreme edges were hit with silver. I find that it's best to start out pretty reserved, it's always easier to add more later than it is to clean things up due to overzealous application! 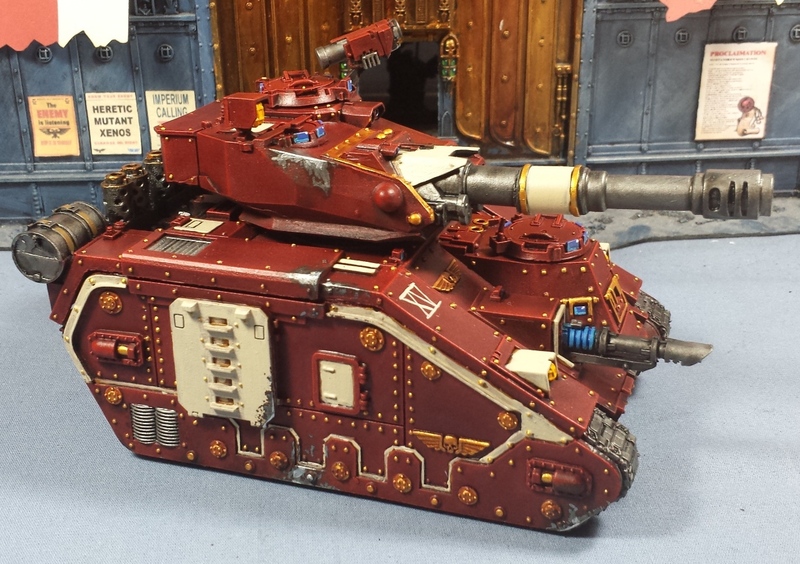 The command tank has the reversed colors on the side panels which seemed to work out pretty well. Overall I'm quite pleased with how the squadron turned out! "Unit's done, smoke if you got 'em!" ...Somewhat ironic as I quit smoking right around the time I started building this unit. So far so good! Next up on the painting deck is a mess of Ad-mech who have been blurting angry binary at me for quite some time. On the upside it'll be a nice change from painting all the red and white and oh wait... Heh. Grand work! And good luck with the abstinence! 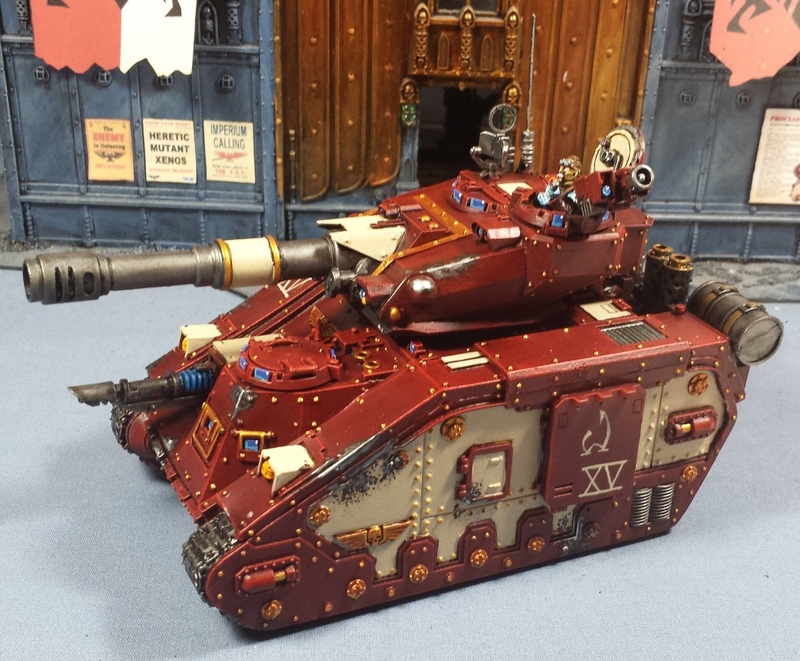 I want some of these Russ patterns... And your fantastic paint job makes them all the more desirable. Good luck with the program, don't go cold turkey, makes it harder by far. Tanks are crackin'. Think some more scratched paint weathering to door/ramps would look cool too, where the doors crash down to allow the crew to escape a nasty stunned result? As all ways, nice job. And damn you for painting so quickly. PS: Good luck with the quitting smoking. I did and it is tough to start with but great once you have managed it. 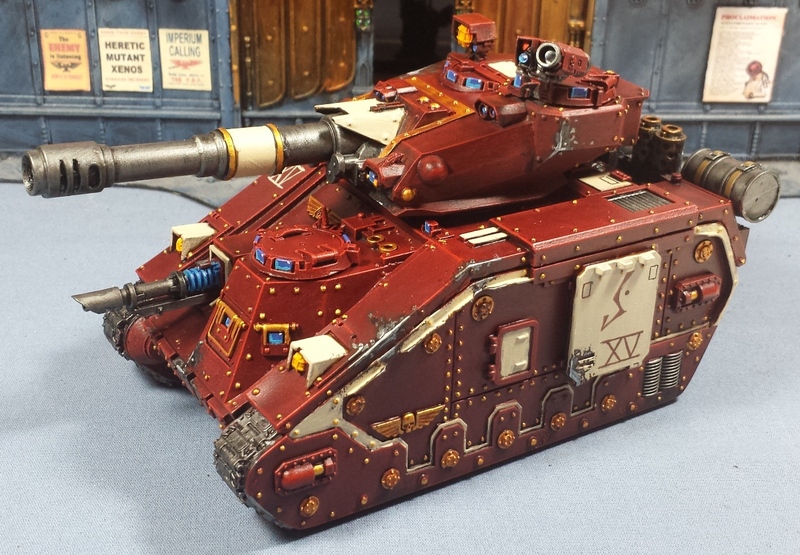 Absolutely lovely tanks! Well done! Great work, so much detail to look at. 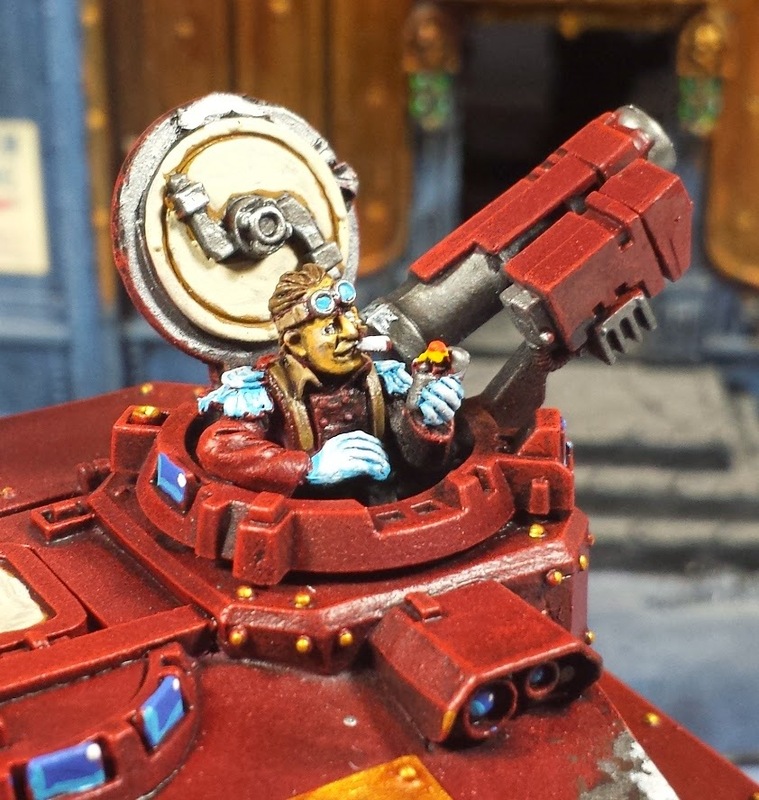 Love the tank commander! And good luck with quitting! @Peter Ball: Thank you very much! @Zab: Hah! There were moments where the models were at risk, no doubt there! @Craig Bowles: I really appreciate it! @Dai: Thanks bud, I had cut down to one or two a day over the last year, and the chantix has essentially removed the minor cravings I was having trouble getting past. I've heard it's gotten mixed results for some, but over the last month it's been working really well for me! @Stephen: Cheers mate! We're going to need to figure out a way to get your wolves across the table from my sons when the book finally drops! @Anurien: Hah! Thanks man - been really enjoying painting the sons, so they've been flying off the painting desk! Cheers on the good vibes for the quitting - It's surprising just how hard NOT doing something can be. @Greg Hess: I really appreciate it! @The Man In A Hat: Thanks! I quite enjoyed the commander, I was really pleased with the victoria miniatures bits! where do you buy those king russ????????????? ?